Desiree Trattles was born in Sweden. At five years of age, she moved with her family to Calcutta, India. She attended boarding school in the Himalayas, studied art in Brazil, and economics in Sweden. In her adult life she was a tour guide in Ibiza, Sri Lanka, and the Canary Islands, painted catamarans on a beach in the Caribbean, delivered sailboats up and down the East Coast of the U.S, etc. In her mid-thirties, she and Isle of Wight husband, Chris, moved to New Zealand. They lived in Paraparaumu and after going back to University to take an Accountancy Degree, Desiree worked in Wellington as a chartered accountant for one of the “Big Five” firms. 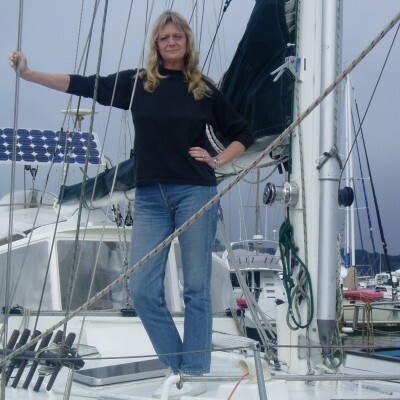 Sailing has always been Desiree’s great passion and in 2007, she and her husband left New Zealand to follow their dreams and sail the world in their small yacht, Skylark II. After 15 years living on board full time, last year they sold the boat in Malta and moved back to the Isle of Wight. They are currently renovating a house in Ryde, called appropriately “Anchor Down”. A Harrowing Journey is Desiree’s first book.